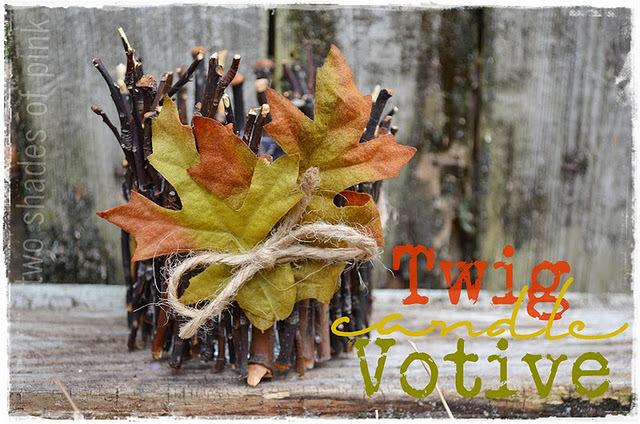 This Fall twig votive is a great DIY Fall decoration that your kiddos can help with. You will want to do all of the hot gluing, but you can send the kids off to hunt for twigs and leaves to get you started. You can see the tutorial for this twig candle votive over at Two Shades of Pink. This is really clever! What a good idea. I didn't want to leave a comment on your giveaway post (knowing that you're probably getting hundreds there! ), but I did want to tell you that I read your Jenny Craig post and I am so proud and happy for you! I remember telling you at Blissdom that you looked exactly like the photo I'd seen of you online. It had never registered with me before then that I had NOT seen a photo of you on your own blog, just at CSI! You are such a beautiful woman, and I have no doubt that you'll be even more beautiful as you lose whatever weight you'd like to lose and become healthier. I think it's cool that you're sharing your own journey. I'm guessing it's a win-win for Jenny Craig and for you; I hope so. Thanks for being brave enough to share something so personal. You inspire me.